#1. People with lived experience support each other to achieve self-determined lives of their choosing. #2. People with lived experience support providers to sell their products and increase market share. By all appearances, definition #2 is winning. MHA has just unveiled its design for National Peer Specialist Certification. It effectively guts any hope of the kind of natural human relationship that used to be common practice under definition #1. S. Davidow. The Downfall of Peer Support: MHA & National Certification, https://www.madinamerica.com/2017/04/downfall-peer-support-mha-national-certification/ At the same time, we're seeing the downfall of SAMHA, and the rise of national legislation to limit peer roles. Where the F* is the ADA? First an aside. Why isn't anyone challenging this crap on ADA grounds? Peer workers are a professional group with our own values, expertise and ethical considerations. Every other professional group creates its own code of ethics and is self-supervising. Can you imagine how psychiatry would respond if Congress tried to pass a law appointing SAMHSA or the National Department of Health and Human Services to supervise psychiatrists? Nor would MHA presume to define the professional future of modern psychiatry - essentially making rules about psychiatrists without psychiatrists - as they did to dislabeled peer specialists. Suffice it to say, psychiatry would go apoplectic if some outside body appointed itself to govern their own. Can you imagine Mad in America or the Foundation for Excellence in Mental Healthcare presuming to decide how the members of the psychiatric profession should be trained, what their ethics should be and who should supervise whether they are meeting the standards? Just as important, outsiders don't do that for psychologists, nurses, or counselors either. All of these professions have their own bodies who develop their own ethical standards and methods for self-regulation. That is the nature of a profession. Peer support came about because these professions were failing us. Peer support succeeded, where existing professions hadn't, because we had our own expertise and our own way. That valuable, independent expertise is how we got our market share in the first place. Yet, the U.S. government and a national non-profit funded for our benefit have no compunction about substituting their judgment for ours about what is best for our profession and how we should use our own expertise with our own people. The assumption that dislabeled people can't function independently or ethically manage our own affairs is discriminatory on its face. No less disturbing, the limitations imposed go to the heart of our civil and human rights to self determination, independent voice, and employment on our own terms. These are exactly the kind of things the ADA, the Bill of Rights and the Equal Protection clause were enacted to stop. This is exactly where our lawyers and funded advocacy organization can step in and help us entirely change the conversation. They can help us to know exactly what we need to do to lay the factual foundation we need to shift the paradigm. As a peer community, we are capable of supporting institutionalized others to live 'safely' in freedom. The government is willing to pay for safety. (This is a no-brainer. The authorities basically admit this fact when the institutionalize someone). That's basically all there is to it. Once we can demonstrate our capacity to safely provide for our own, existing funding is Constitutionally required to be rerouted to us. This is because the federal law preferences community living over institutional living. This gives institutionalized people a legal right to chose independent living and the peer services and community resources that make this possible over institutional living and the institution-related services operated and offered by mental health providers. Instead of paying $300,000 a year to warehouse one of our people, we could reroute that same money to community housing and peer support. Thus, 9 individual trained in peer support could get together with one institutionalized person. We could buy a $200,000 house where all 10 could live. We could all work about 20 hours per week helping our friend to live safely and well in freedom. In the first year, everyone in the house could have $10,000 to live on for food and expenses. After year one (with the house paid off and our friend permanently housed), there's $30,000 / year to equitably divide among us in return for around the clock care and support for as long as the legal system determines that our friend needs that level of assistance. In other words, the 2 biggest needs of our community - meaningful jobs and housing - could be met entirely with funding that's now going to medical model warehousing. Now, that's advocacy! And we could be on our way there right now. We simply need the advocacy organization who represent us to set that kind of litigation strategy up as a priority and help us to map out the factual steps in the process that will be needed to meet the legal requirements for making our case. Are you ready to learn how...? Increasingly, there are funding streams that are coming available under, not just under the medical/ healthcare system, but also under the Olmstead/Curtis right to the community. Olmstead/Curtis can be reasonably interpreted as recognizing people's right to as much community as possible while still balancing pressing public safety concerns. With baby boomers getting older and a huge number of kids who are growing up in the psych system, there is increasing pressure for de-institutionalization, expanding community living supports, as well as healthcare costs containment. I don't know the exact facts on this, but I've heard from sources who follow this that some states are getting federal grants to do this Olmstead/Curtis kind of work and are charging between $100,00 and $300,000 per person per year to move someone from an institutional setting to the community. In addition, many states (e.g. Vermont, California) have also started independent living funding streams that assist dislabeled people to stay in the community. As a result, dislabeled people are now hiring their own home companions who have no formal qualifications. I currently hold one of these jobs, so I know they exist. People with lived experience can and should be doing this kind of work. The basic requirement is the ability to assist someone to achieve a self-determined life of their choosing. That is what peer support (definition #1) is all about. Moreover, the need really is there - both in the public and private sectors. Training for personal care assistances (PCAs) is largely geared toward assisting people with physical disabilities. So many PCA know next to nothing about psychosocial dislabilities. In addition, many PCAs and the organizations they work for are scared by the publicity around 'mental illness' and won't take these kinds of jobs. Our Technical Assistance Centers and peer-run organizations should be all over these kinds of opportunities. Tons of us have been trained in peer modalities only to be told that no jobs existed. This kind of training (which many of us have no outlet for using) is ideal for assisting those dislabeled by psychiatry who want to stay in the community. Our peer non-profits and TA Centers therefore should be assisting our people to access, connect with, and expand these service opportunities. They should be helping create local networks of peers who want to offer and receive these kinds of services. They should be supporting peers to set up and publicize their own business models to address and serve existing market needs. They should be actively lobbying for more and more independent living funding as a win-win for all involved. They should have their constituents out lobbying for this kind of funding as well. Once a solid, working relationship is established, the case can be made that the person can survive 'safely' in the community with our help. It would be violate the person's right to liberty for the State to say it was willing to pay for safety only in a custodial setting but not in the community if both are comparable in cost and ability to achieve legitimate state objectives. Arguably, even the peer relationships we form with people in institutional settings or provider housing should be compensable under the above theory. This same theory also should get us access to these settings - along with the right to offer our services behind closed doors to those who want them. Independent peer support is not the same as provider-provided peer support. The latter usually has to follow medical ethics rather than the ethics of natural community relationships. Accordingly, the latter simply does not have the same feel to it, as anyone who has ever seen a therapist or case manager can tell you. Having a non-institutional peer relationship may be the closest thing to a natural community relationship that an institutionalized dislabeled person may ever get. Peer services can be provided at comparable safety levels to that of other kinds of visitors the institution or provider allows. 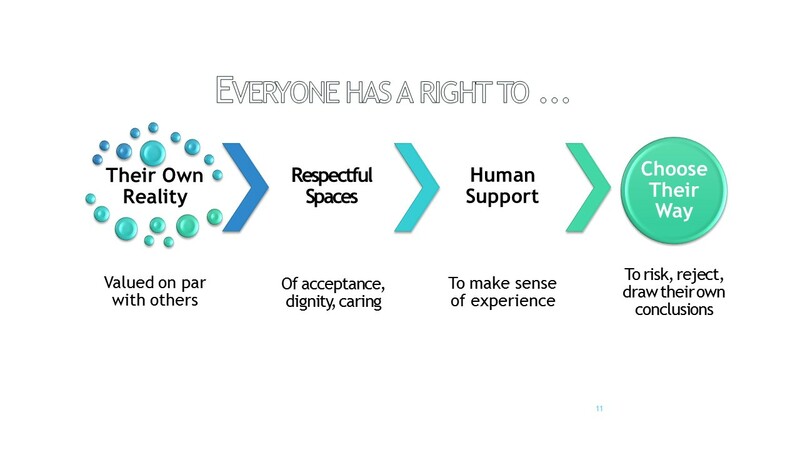 People in professional treatment settings therefore have a right to the contact with persons with lived experience, and the independent living expertise that we offer. A reasonable accommodation for accessing some semblance of 'community' if they live in a segregated treatment setting. A cost-effective, user-friendly alternative to conventional services. A legitimate choice and necessary counter-balance given the clear psychological harm of treatment settings where social contacts are limited to other treatment-dependent dislabeled people; as a result, those in segregated settings rarely see or work with dislabeled people who are living free and doing well in the community. A matter of affirmative action given the systematic provider exclusion of independent peer voice, values and wisdom from conventional treatment settings. To ensure the cultural competency of the services offered, given widespread discrimination against 'mental illness' and the clear challenges faced by those who have to navigate conventional culture as dislabeled persons. Succeeded in their efforts to survive and thrive in the face of challenges that lead to systemic entrenchment for many dislabeled people. In social science terms this kind of expertise is well-accepted. It is known as "positive deviance." Peer support is effective largely because we are not healthcare providers. Rather, we are people from the community who are actually dealing with these issues. Thus, independent living is an expertise in its own right. It addresses an entirely different human needs and values than healthcare. The needs involved include the sense of worth that comes from experiencing full citizenship and community living. The core values include participation, belonging and freedom to access supports and resources of one's choosing. These needs and values, essentially liberty and democracy, are far more fundamental to American history and law than the right to healthcare. Indeed, the focus of the healthcare profession is entirely different. The primary consideration for healthcare professionals is not customer choice, liberty, freedom or preference. The main concerns are health (including physical safety) and liability. Any 'care' provided is first subjected to these risk management considerations. Thus, due to liability concerns, it is often more convenient for providers to thwart independence than encourage it. In the Vermont State Hospital, a patient was forcibly restrained for trying to stand on a chair. It was considered unsafe, inappropriate behavior. She could fall and that might lead to a lawsuit. In the community, people use chairs to improve their reach or vantage point all the time. Rarely does anyone question it - or fall. The independent living know-how offered by peers is something the medical/ healthcare profession is ill-suited to limit, direct or supervise. In the first place, there is often a direct conflict of interest between the institutional services and independent living. Both financial and liability concerns dictate that providers will error on the side of caution. So long as insurance is in place, it is usually safer and more profitable for providers to to keep someone in custody rather than release them. The goal of lots of people is to live on their own without provider intervention. The people who manage to do that have to find a way to live without continued provider involvement. By definition, the provider system has little contact with these people and knows very little about how they manage to stay independent once the person and the treatment system part ways. Providers also have little comprehension of what it takes - even while people are under their 'care' - to live well, feel well and be well in a natural environment as a dislabeled person. In fact, the mental health rules of ethics basically prevent providers from participating in our lives in any form of natural way. So how on earth can they claim to know what we are doing or how we are doing it in our successful attempts to free ourselves from their 'care'? In other words, we have every right to establish ourselves as an independent self-supervising, reimbursement-worthy, professional discipline. Our expertise is necessary and valuable in and of itself. We are not merely an arm or instrument of existing healthcare services. We serve communities, families and dislabeled persons in important ways that conventional healthcare, by its own design, cannot. Hi you people are really doing an awesome. I was looking for assisted living in Denver Co, and found your post. Very Impressive.